Improved Weather Reload R6 was completely reworked weather with using 92 textures from sky high-resolution, light of lamps and headlamps traffic. Adjust the frequency of morning fog, heavy fog rare. Configured HDR. for night glow light sources. No excess of bloom. I really like the mod. The weather has really changed a lot with cool lightening with hundreds of HD textures. There is sometimes fog coming in the morning. Very realistic. If the weather is very clear, the weather is very clear. If the weather is cloudy, the weather will be cloudy. Unlike the original weather when the weather is fine hundreds of clouds appear in the sky. With the new Alpha version of Weather Reload, the mod just got even better. The graphics became more natural and colorful (not cartoony) esp. when at HDR. The weather also became great to look at the latest alpha version. If you look at the clouds cover, it is very great and realistic to look at. Every morning, every afternoon, every evening, or even every dawn or dusk; everything look great to look at. Sun looks like a bright orange sun setting down in the sky and the clouds were able to capture a similar thing when we usually look at a common sunset. When rising, the sun looks a bright yellow sun rising up the sky and even the clouds were able to capture a similar thing when we usually look at a normal sunrise. Though in some parts In the morning, noon and afternoon, the sun wasn’t that took bright enough to look at. Sometimes the rays of the sun doesn’t look like a great thing to see in your truck window and you could directly see the shape of the sun. In short, it isn’t that bright enough to look at the sun. The new great feature in this mod is the morning fog that is occurring. Though it happens nearly at every dawn. I hope the author will fix the morning fog from always in the dawn to sometimes or seldom at dawn. The afternoon dawn also happens, but it happens seldom or sometimes and that’s what I like. Of course it doesn’t fog all the time everyday right? The rain part is great. Skies get dark because of rough clouds and it looks good to see. After the rain the cloud clears for the sun to make another wonderful day. Unlike ETS2 where when it is about to rain, clouds slowly gets dark then form like a stratus clouds (lol..) Here, the clouds gather, become big, become dark then rain. Also it gets foggy when the rain gets too much cats and dogs. Unlike in the normal weather system that ETS2 has, if it’s really a clear day, it is really a clear day with few or no clouds after all. 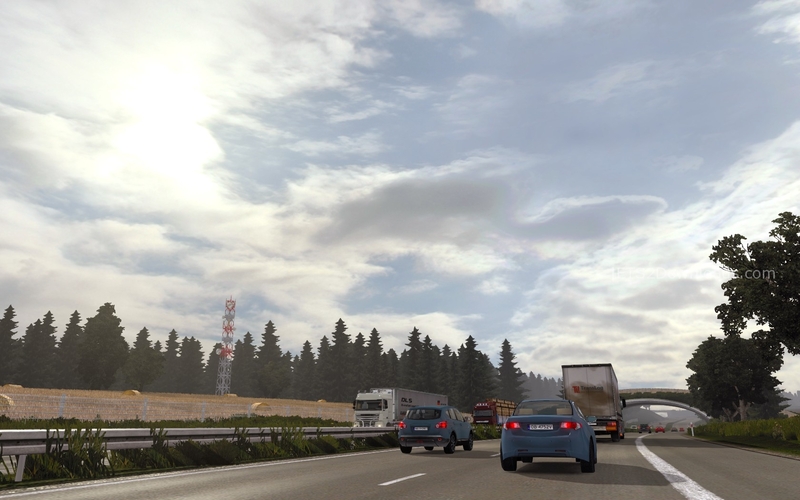 Unlike ETS2 where clouds seems to scatter around and you see huge clouds forming, even in a great day. Those kind of scenery are only good for a normal weather, but it shouldn’t be like that all the time. This mod is not only a weather mod but also an environment mod since the author was able to change the colors and some parts of the environment. Revision of the general lighting of whole daily cycle. Removed an afternoon fog due to some problems during the testing. Completely changed rain drops on the glass, changed the parameters and texture. Don’t use this mod with other weather mods. Works with Realistic Weather Sound or do i have to disable it? Thanx. Works fine on 1.14 :). Too bad it doesn’t work with mha 1.6 and ets 1.14 🙁 Every time when i enable this mod, the savegame crashes..
Yea, just wait. I think the new version is out next week! yeah the game crashed and removed the mod unfortunately but it is definitely one of the best mods ever created for this game. New version will be out soon! Surprisingly this map mod didn’t work for v1.14 but I used this mod at v1.13 and here’s my review. Weather reload r4 is one of the best weather mods I ever seen. I was looking forward for RED ets2, which is now in the alpha stage, and somehow hasn’t been developed further and the progress has been quite slow, but now I stick to other options, which one of them was weather reload r4. I used it at v1.13 and the effects were pretty quite cool, the sun, weather everything. Hope that they would update the weather mod. Keep it up team! With fix for 1.14.x, I was able to use IWR R4. Used with FAEL Environment mod which gives some nice textures and colors. But with the updates added in R5, why does the author not provides an update patch to upgrade from R4 to R5 rather than download whole 660 MB files again. Everyone does not have unlimited connection, especially me with a metered connection!! One of the best mods for ets 2 and the best mod in its category. My Congratulations and thank you for providing this amazing work. this is a good mod for ets2 but, can you translate your download page to english please?…. Just enter the captcha then press Download button :D.
maybe this mod are not compatible with frosty late/early winter mod? Realistic headlights also I have observed with the new version. In my headlights they bright up better than before. Works with graphic mods too like Brutal Environment Extreme. Nope I just tried it, doesn’t work with it. Does this work with Promods and RUS Map? Gotta keep tracking on that. Adjust the lighting in the rain, the sky is lighter shading objects. – Fixed redness lighting on the ground at sunset and sunrise. – Fixed bug with fog in the morning during the transition. This mod file contains couples of new configs. You need to use it with the 5.5 mod! Will Potter, can you keep the updates on this website: The mod maker has kept updating the mod. Thanks! – reduce the intensity of illumination at night, HDR minor changes. – Fixed time the weather changes during the day. from 11 to 16 increased brightness and reduced yellowness, mangled shadow. – Fixed sunset and sunrise. – Adjust the lighting in the rain, the sky is lighter shading objects. – Mid-day a little brighter. – Distance fog increased slightly. – Removed the color correction in the rain. This is an alpha version of the 6th revision. With regards to the distributors , write the description at least that this version is nothing to do with the final version will not have this test. In the archives of the two files. standard with HD textures and file with raindrops and music. I have done that. Thanks for the suggestion my friend! I keep 5.5.2 ? or I remove and put the 5.5.3 ? I have added your review into the post. Thank you so much mate! I have same problem like menchaere: red sky. I had real light graphic and real light graphic lights i disable it but same red sky. Is possible this mod conflicts with : perfect real physics? Thanks. P.S i am glad i get rid of all that rainbow color around beacon. Try to turn of the Colors Correction in the Settings! Related to environment i use : real life graphics mod along with real life graphics lights. And i also use Perfect real physics mod. Will try now what you suggested and thank you for help. Tried your suggestion and more. Unfortunately still red sky. Thanks anyway for help. Hope someone will figure out what’s wrong. I will try to ask other players about this problem and will reply you as soon as possible! Thanks allot. Hope will find a solution this mod seem really good. Hello , I got the problem with running this mod.I tried it but game crashes even If I disable every mod which I using.I have installed 1.16.2 steam version no matter if I run x86 or x64.Any sugegstion what can be possible cause ? 1. Give me your game log. 2. Have you tried to use it with new profile? absolutly nice work!!! Really beautiful… i cant believe!!! 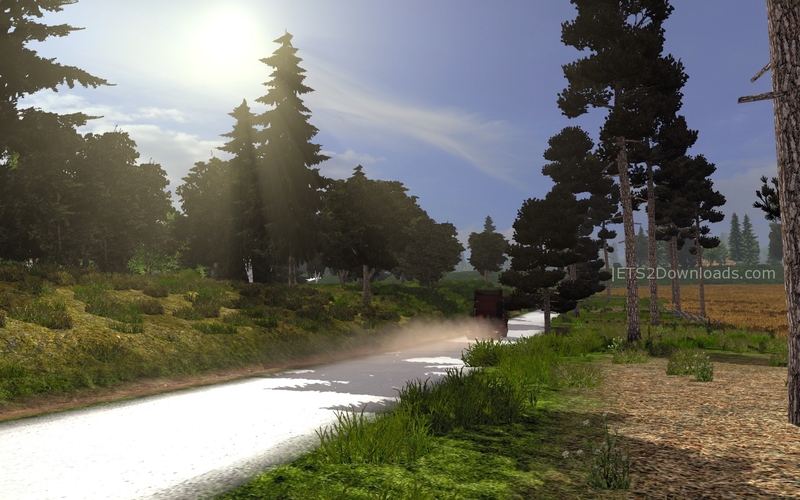 Red sky here too w/the latest version of ETS2 (1.16.whatever). Mind you, I’m only using IWR 5.5.4 or 5.5.5, NO other mods at all. Color correction is on. If I start enabling other mods (even if I only enable a few AI packs of Jazzycat and nothing else), the game will crash as soon as I try to enter the settings or click on Drive. I tried a new profile and got the red sky again. R5 blew me away and I was singing its praises for months. I don’t like R6 at all. With the improved weather of stock 1.17 it’s like they changed the rain just for the sake of it, which makes it look unrealistic, and lighting at night is still as bad as stock ETS2. I was very disappointed with this, but on a positive note it does make the GPS arrows much easier to follow without the F3 overlay, just using the in-dash GPS. I only wish this mod did not change the sound levels, i.e. make outside sounds loud in the cabin. Otherwise I really liked it, but please make it an option to NOT change sound levels from outside to inside cabin. That was the deal breaker (to me at least) for an otherwise excellent mod..
Yep seems like some players doesn’t really like the sounds. I hope the author will give it more options in the next version! The new download link is live now buddy! Can anyone tell me the load order for this mod? And if used with Brutal, should this mod take priority? For anyone who’s interested, R6 is working fine with all updated maps. 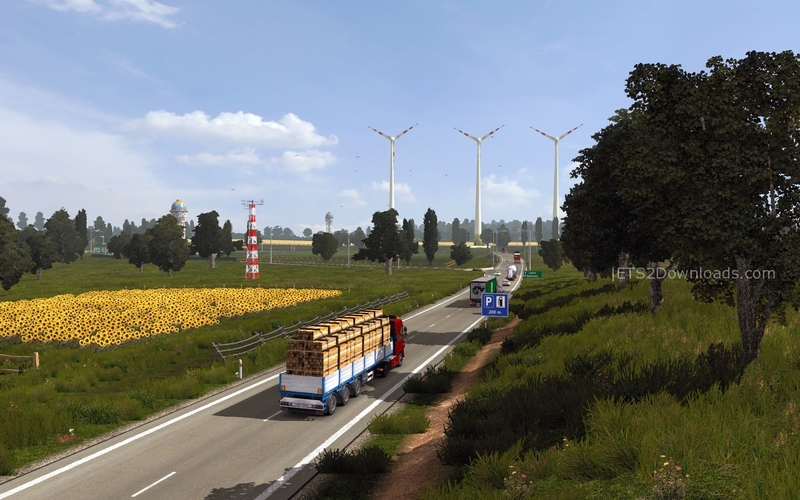 For use with Promods 2 though, delete the “climate.sii” and climate folder from the Promods 2 def folder. I believe the author of this mod is now working on an R7 version. Thank you very much for the feedback mate! I will update this! Thumbs up from me. This is the best weather mod I’ve tried, IMHO. I don’t try this with 1.23, will it work?